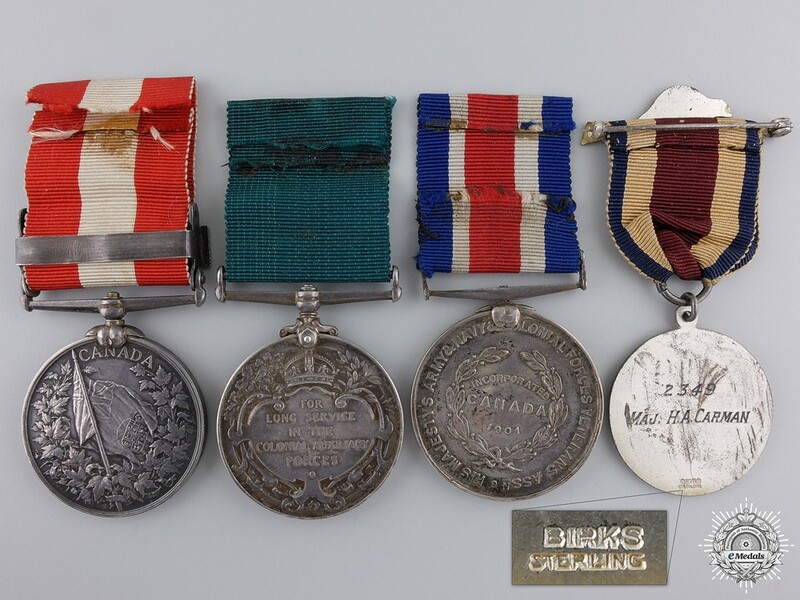 A Canada General Service Family Group - A. Carman: Canada General Service Medal, 1 clasp: Fenian Raid 1866 (CAPT. A. CARMAN 7th C.B. REGT.). Harry A. Carman: Colonial Auxiliary Forces Long Service Medal, George V (CAPT. H.A. CARMAN. 106th REGT. (WINNIPEG LIGHT INF. ); His Majesty’s Army & Navy & Colonial Forces Veterans Association Medal (SERGT MAJOR H.A. 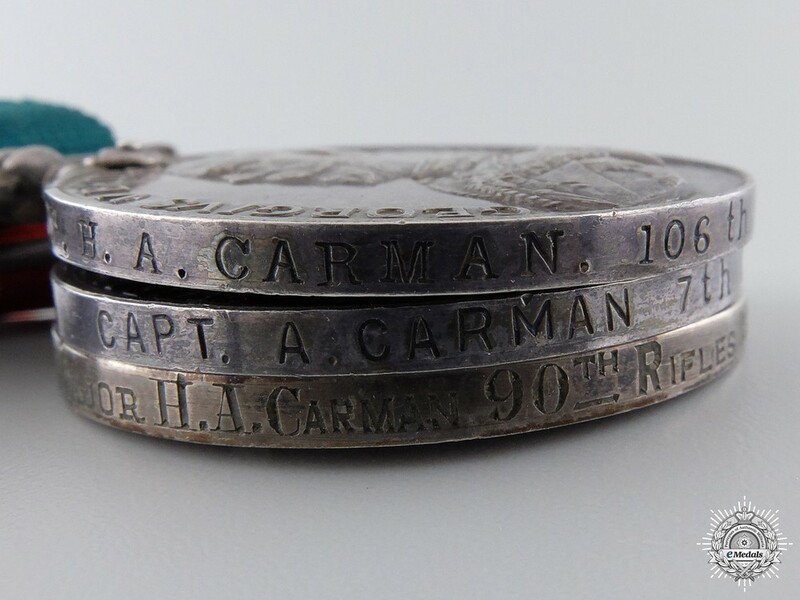 CARMAN 90th RIFLES 1888-1898); and Army & Navy Veterans In Canada Medal (2349 MAJ. H. A.CARMAN). Naming is impressed on the CGSM and CAFLSM, engraved on the edge of the HMANCFVAM and the reverse of the ANVCM. 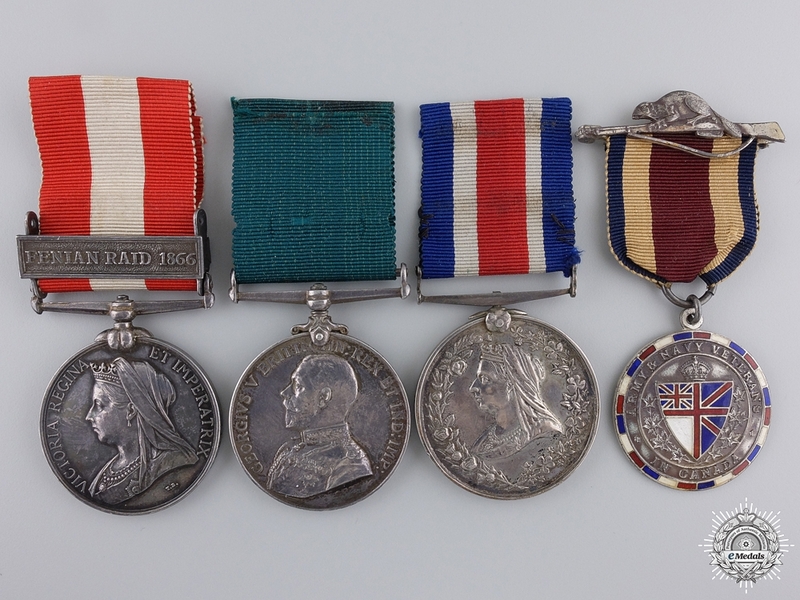 Un-mounted, original ribbons, the CGSM is a private replacement medal, privately impressed with a late issue clasp, the ANVCM is maker marked "BIRKS" and marked "STERLING" with a beaver and rifle pinback hanger, bruising on the CAFLSM, dark patinas on the two official medals, light contact, very fine. Accompanied by copies of Pay Records and Henderson's Winnipeg City Directory for Harry A. Carman. Footnote: Capt. A. Carman does not appear on regular or late issue rolls for Canada General Service Medal and is not listed in the "Canada General Service Medal Roll, 1866-70" by John Thyen. Harry A. Carman was born on November 11, 1871. In 1885, at the age of fourteen, he joined the 90th Winnipeg Battalion of Rifles and served for seven years in the ranks before being appointed Regimental Sergeant Major, probably one of the youngest RSM at that time. In 1912, he resigned from the unit, in order to go to Officer’s Training School and was commissioned as a Lieutenant with the Winnipeg Light Infantry in October 1913, becoming a Captain in August 1914, until 1915. Although the Winnipeg Light Infantry formed part of the 10th Battalion CEF, it does not appear as though Carman served overseas but remained on the home front. He resigned in 1917, but later became Honorary Lieutenant-Colonel (1925-1926) of the Regiment, as is also on record as serving as Major, Officer Commanding the Winnipeg Light Infantry (1921-1931). Carman received his Long Service Medal by General Order 53 in 1917. In his civilian life, he was employed with R.J. Whitelaw and Company for fifty years, first as a Clerk, and later, many years as Office Manager. He celebrated his one hundredth birthday, as mentioned in the Winnipeg Free Press, on November 11, 1971.